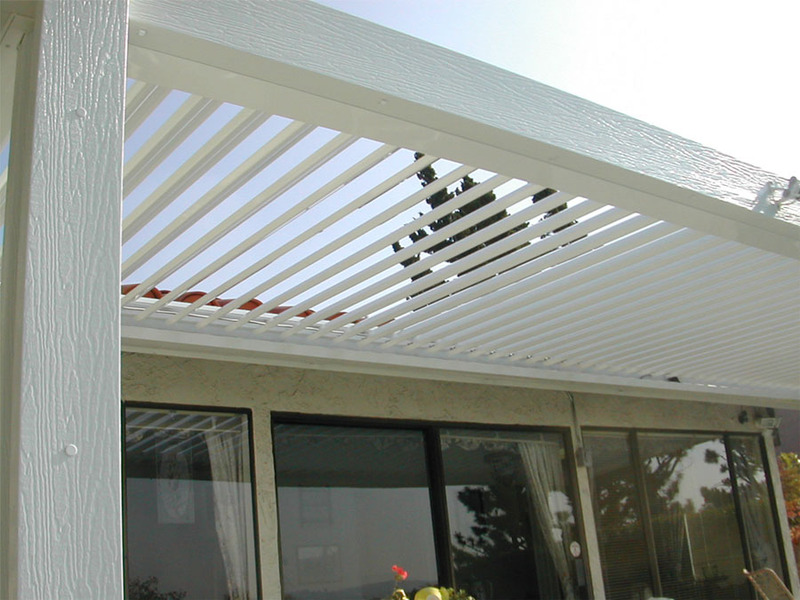 Louvered Patio Covers | Canopy Concepts, Inc. The Eclipse can be built as a patio or commercial awning, as a roof for glass or screened enclosures, or to cover a swimming pool. In manufacturing areas where fumes and heat are a problem the Eclipse provides the required ventilation. 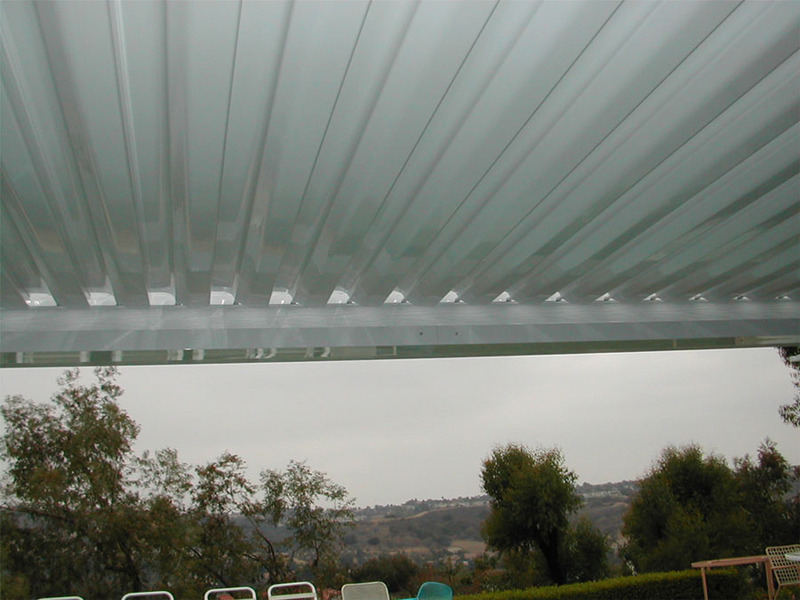 The Eclipse Opening Roof may be installed flat, pitched, or used vertically as a privacy screen. The smooth flowing lines, together with a vast choice of colors and finishes, allows the Eclipse to blend brilliantly with any architectural style. In winter the slim louvers of the Eclipse can be positioned to catch the sun’s natural warmth into rooms to save on energy costs. In summer these same louvers can then be moved to block direct sunlight to protect the building from unwanted solar heating. 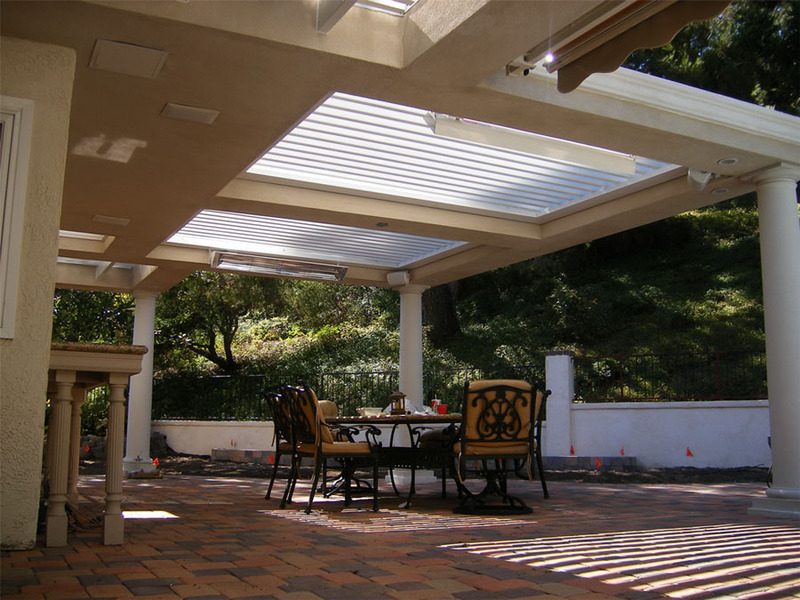 Winter or summer – the Eclipse Opening Roof provides the best of both worlds! With the simple push of a button, the louvers can be moved to give the desired lighting level into a building. The natural light illuminates work or living areas while providing savings in power consumption. In an outdoor area the same push of a button allows you to control the light needed to create the right atmosphere. During the summer months a place is often sought that provides shade from sun’s heat as well as cool ventilation. The Eclipse provides this by angling the louvers to a partially open position. Even in light rain the louvers can still be left partially open and the water will drain in the contours of the louver. 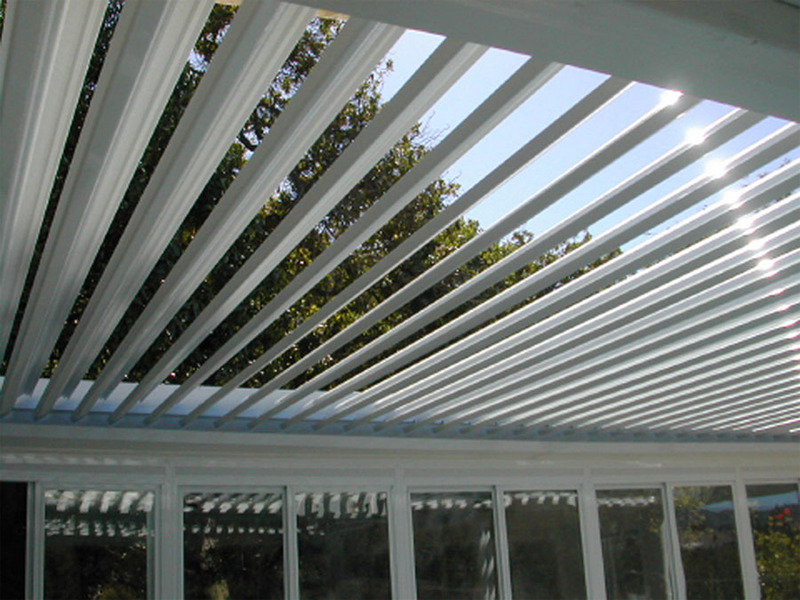 The Eclipse Opening Roof has a uniquely designed louver that provides complete overlap with no possibility of rain penetration. 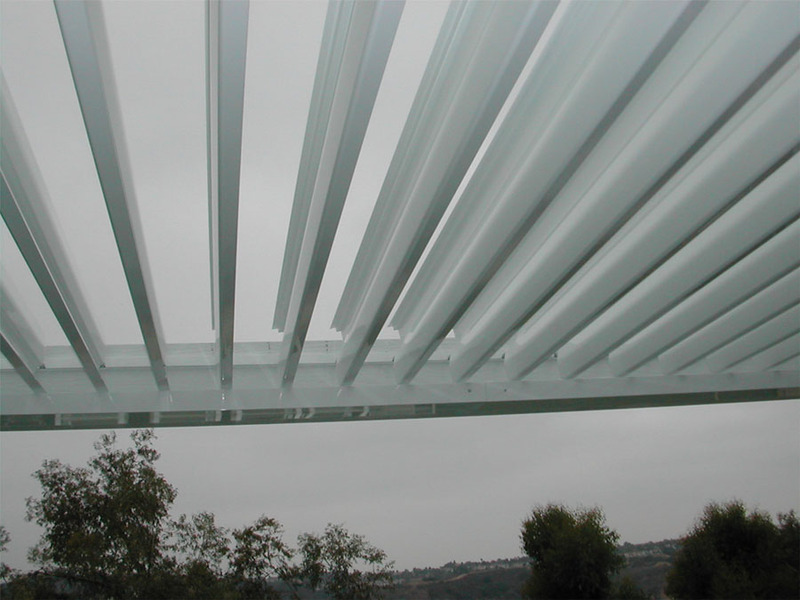 Tests show that high pressure water could not penetrate the joints between the louvers. The Eclipse provides the ultimate control over the amount of shade needed. The amount of heat and light can be varied for work or relaxation. For those with sensitive skin, or those concerned about health risk due to sun exposure, the Eclipse is the perfect answer – full light can be enjoyed without direct sunlight. The louvers rotate from sealed shut to almost 180 degrees by use of a small 12 volt DC motor. Safe to use and incredibly easy to operate, the motor is powered by either a solar charged battery or a transformer connected to 110 volt mains supply. Multiple switches can be provided to allow control from different rooms or locations. For special projects, control options can be designed to your requirements. The Eclipse system is comprised of aluminum and 316 stainless steel components which have been designed to provide a high level of corrosion resistance. 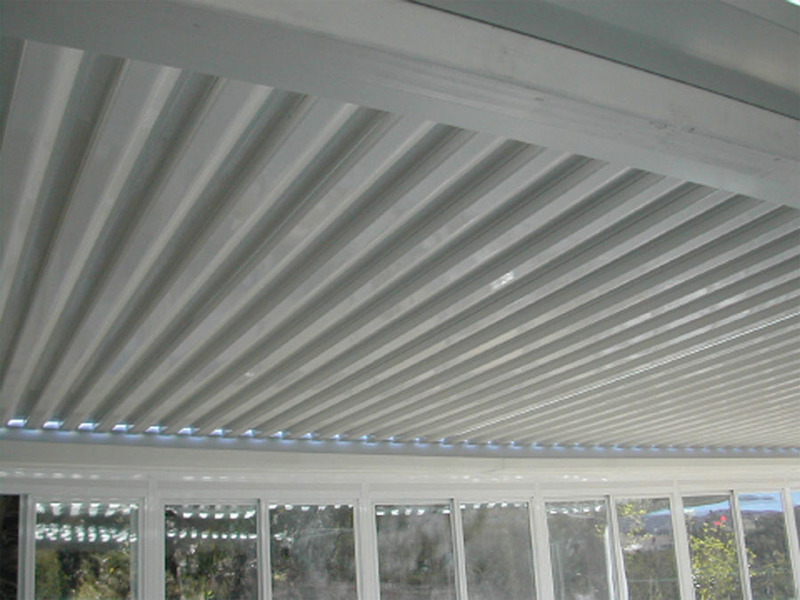 The solid extruded aluminum louvers are powder coats for years of trouble free service and come with a 5 Year Warranty.